As I’ve been searching the Internet and stores over the past week for the “perfect” gifts for the people on my Christmas list, I’ve found myself seeking out gifts that support a charity or cause. I mean, what’s better than giving a “double gift”? It’s a gift not only for your sister or your favorite teacher, but also for the charity it supports. Heart of Haiti is one such charity, helping to rebuild Haiti through “Trade, Not Aid.” You’ve heard the proverb, “Give a man a fish and you feed him for a day. Teach a man to fish and you feed him for a lifetime.”? Heart of Haiti operates by this philosophy, creating opportunities for Haitian artisans to earn income with dignity by creating jobs and income for the people of Haiti. So far, the Heart of Haiti collection has led to employment of 350 artists in Haiti and has provided some financial benefits for an estimated 4,000 to 5,000 people in the country. Each item is designed by a master Haitian artist, made by hand in Haiti, and crafted from recycled materials. The collection includes 40 different home decor items and accessories, from vases to picture frames to necklaces. Shop the Heart of Haiti collection on Macys.com. 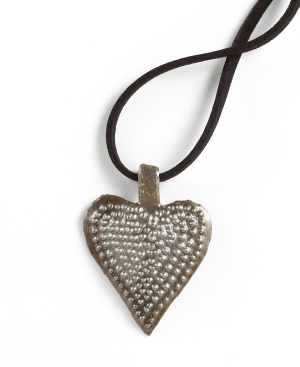 Disclosure: I am writing this post to spread the word about Heart of Haiti through a Mom Bloggers Club member program and I may receive a Heart of Haiti pendant as a thank you. Previous Previous post: After-School Special: Are you addicted to social media?